Everybody loves a freebie, and designers are no exception! Free design resources such as stock images and fonts are especially useful, as these can often be expensive. However, while there are lots of free resources out there, many of them are low in quality, making it difficult to create professional-looking work. You can also accidentally infringe on someone’s copyrights by using “free” resources that are actually only free for personal use, not commercial use. 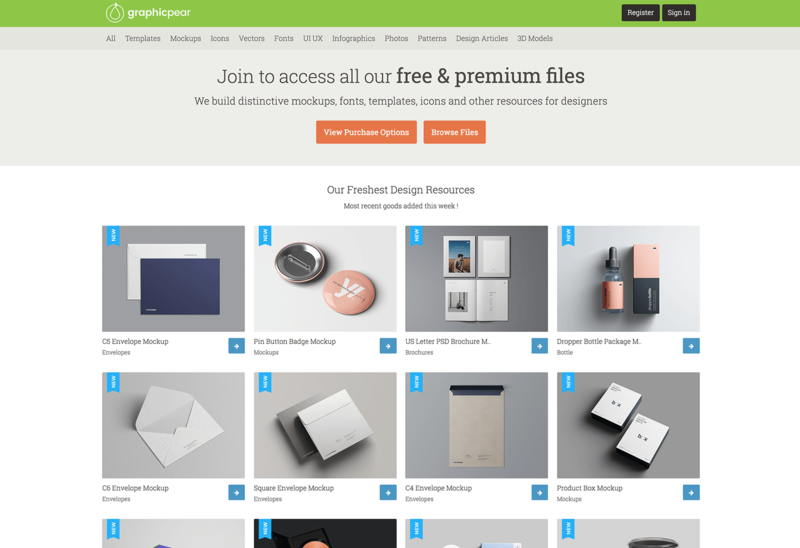 That’s why we’ve collated a list of our favourite free, high-quality design resources. All of these provide tools that are free to use, and most allow both personal and commercial purposes. That means they’re perfect for personal projects to build up your portfolio, voluntary projects for charities and societies, and even professional work for for-profit clients (with the exception of Graphic Pear). Among the many sites meeting demand for high-quality stock images, Unsplash is one of the few providing images of a professionally usable quality for free. 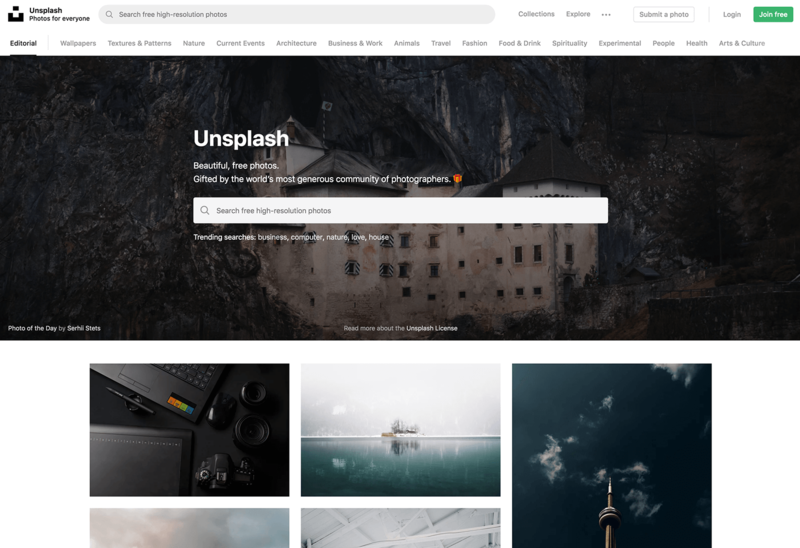 With the proliferation of stock imagery, it can be easy for pictures to look tacky or unprofessional, but Unsplash’s collection promises quality that consistently stands up to that of paid services like Shutterstock. Unlike many of its competitors, Unsplash’s interface is clean, simple and free of any misleading sponsored images. It also lets you scroll infinitely, preview images without loading a new page and download images in one click without signing up, making it quick and easy to find the perfect image. Many free fonts look amateurish and gaudy, but there are gems existing among them that stand up to the more expensive fonts used by professional designers. It can be difficult to find these and understand their font licences, however, which is why tools like Google Fonts are useful. 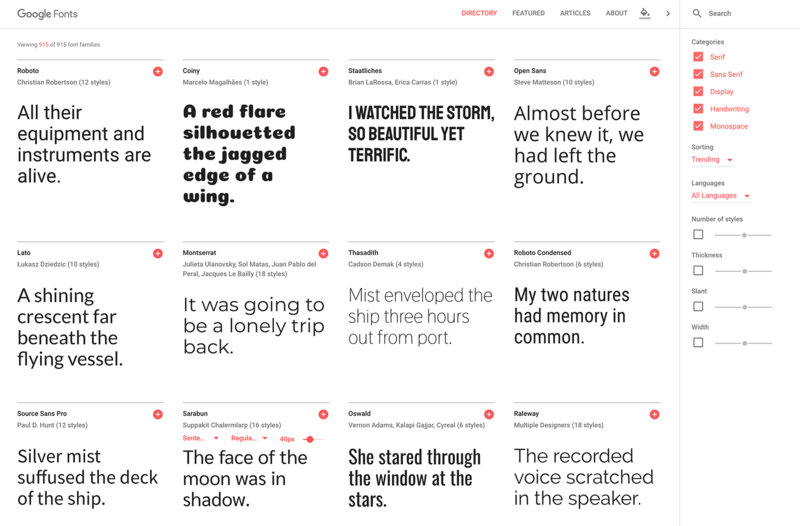 Produced by Google, Google Fonts is a tastefully curated collection of fonts that are free to use, not only in graphic design work, but as web fonts embedded on sites. While tools like FontSquirrel offer more choice, Google Fonts’ interactive interface means you can try out fonts there and then on the page, without downloading it first. It also has a variety of languages, including non-Latin scripts such as Chinese and Korean, and its curated selection means that it’s easy to find a professional-looking font. It also gives you a list of its popular font pairings – useful if you’re using more than one font in your work. Bonus: If you’ve ever found yourself admiring the fonts on a website without any way to identify them, then Fount will be a great tool for you. It’s a bookmarklet that’s easy to install (simply drag the button into your bookmarks*), and upon clicking it while on a page, you’ll be able to highlight any piece of text and see its font, size and weight. *This isn’t working in the latest version of Chrome, but as a workaround you can right-click and copy the link address of the button, right-click and select Edit on any other bookmark and paste the link into the URL box manually. It’s also useful to have a set of mock-ups which show you how your designs might look in the real world. Graphic Pear offers 3D mock-ups of everything from shampoo bottles to teacups, and their design and 3D rendering are of a superb quality that convincingly mimics professional product photography. Its simple, ad-free interface makes it much more pleasant to use than its competitors, and a lot of its resources are free. Others require a paid premium membership, but overall its free offering is generous considering its quality. Note: Graphic Pear only allows personal use for its free assets – without the premium licence, you cannot use them with commercial intent. Many projects, such as websites, benefit from the use of icons, which help to break up text and explain concepts quickly. Rather than creating them from scratch, it’s often more efficient to use free icons provided on sites like iconmonstr, which houses a collection of over 4,000 icons, single-handedly created by designer Alexander Kahlkopf. Every icon has a number of variants and file formats (including vectors) to choose from, and their uniform style means it’s easy to use multiple icons together. The site’s striking design and simple, registration-free interface make it a pleasure to use, and you can also request icons that don’t yet exist (the highest voted currently is “Cat”)! Finally, Adobe’s web tool, Adobe Color CC, helps you pick out the best colour palette for your project, with impressive results backed up by colour theory. 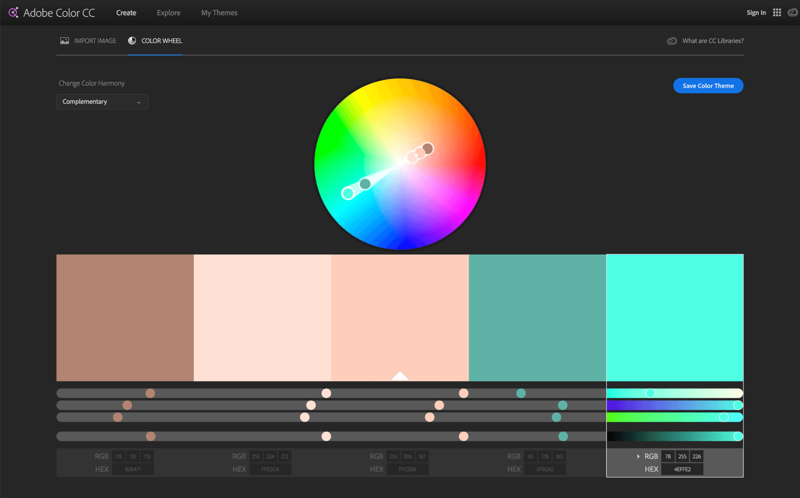 It assembles a five-swatch colour palette based on your chosen colour harmony preset (such as “Complementary” or “Triad”) and either a colour wheel or your own uploaded image. You can save your favourite colour palettes if you have an Adobe account, and if you’re lacking inspiration you can also browse numerous ready-made colour themes. If you prefer to work on the go, then the app Adobe Capture CC provides the same functionality, as well as other features like font identification and custom brush creation. We hope these resources are useful to any budding designers out there, as well as any more experienced designers who might not be up to date with the latest tools on the Internet! Let us know which resource is your favourite, or if there are any that we’ve missed, by tweeting us @gmdesignltd or finding us on Facebook.